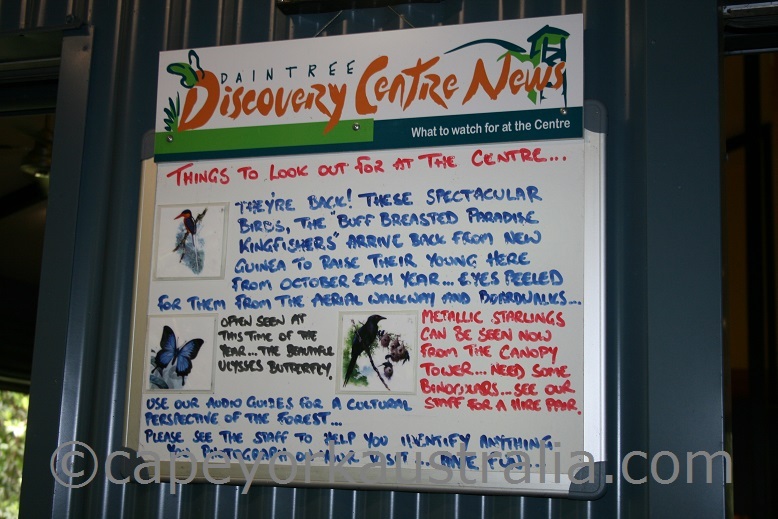 Daintree Discovery Centre is in Cape Tribulation. It is a great place to learn about our tropical rainforests, and especially the Daintree rainforest, which is the oldest continuous one in the world! 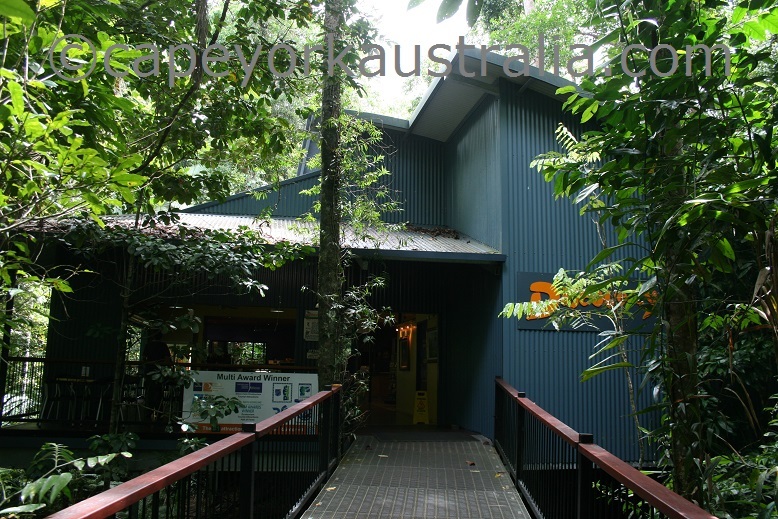 There are boardwalks including an aerial tree top walk, a cassowary circuit, a bush tucker walk with information on Aboriginal food and bush medicine, and a canopy tower with lots of information about every level in the rainforest. Rainforest animals are not always easy to see, so it's worth taking your time and having a good look into the forest from the walk. 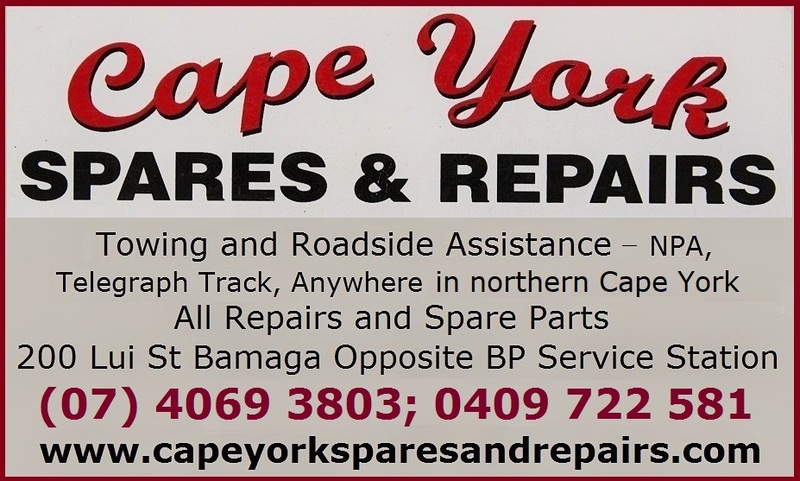 The centre is towards the southern end of the road through Cape Tribulation, there are signs at the turnoff. 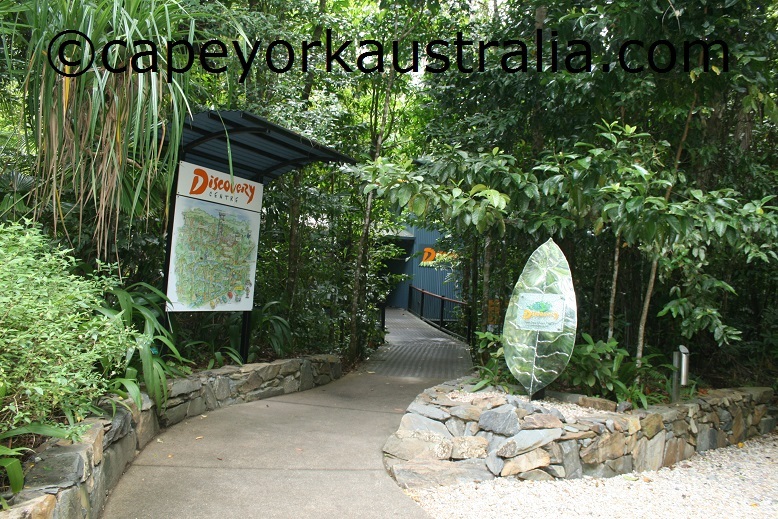 Daintree Discovery Centre is a multi award winning attraction. You first come to the cafe that serves local Daintree tea and coffee; and a souvenir and book shop, where you are given a complimentary interpretive guide book, and get to borrow a hand held audio unit when you buy your ticket that lasts for seven days. As you walk on the different trails through the park, there are numbered audio stations, where you can press the number of the station on your unit to listen to additional interpretive information about the exact spot where you are. 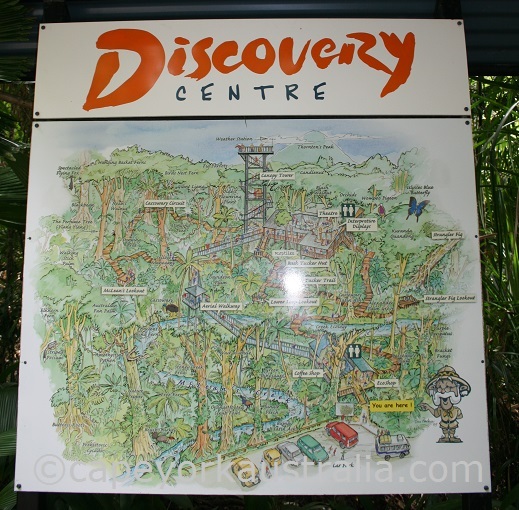 There are four seperate tours: The Aerial Walkway, the Canopy Tower, the Cassowary Circuit, and the Bush Tucker Trail. There is also an Interpretive Display Centre and a DVD Theatre, and even a well stocked library. The Aerial Walkway takes you through mid level rainforest. There are signs about rainforest diversity, why do vines climb and what are the host trees for epiphytes; what are the animals that live in tree hollows, as well as different species you pass by, such as king ferns, tree ferns, strangler figs, Alexandra palms, etc. 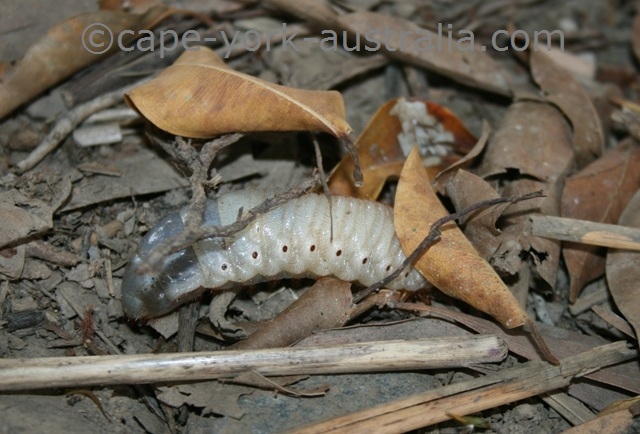 It also takes you to the Interpretive Display Centre, which has interactive displays about broader subjects like ecology and evolution, Australia's Gondwanan origin, and the uses, structure, features and processes of tropical rainforests. The cyclone rated, 23 metres high Canopy Tower takes you to every level of the rainforest, from the forest floor through middle layers up to above the canopy. On every one of the five viewing platforms there is plenty of information about the plants and animals of each level. 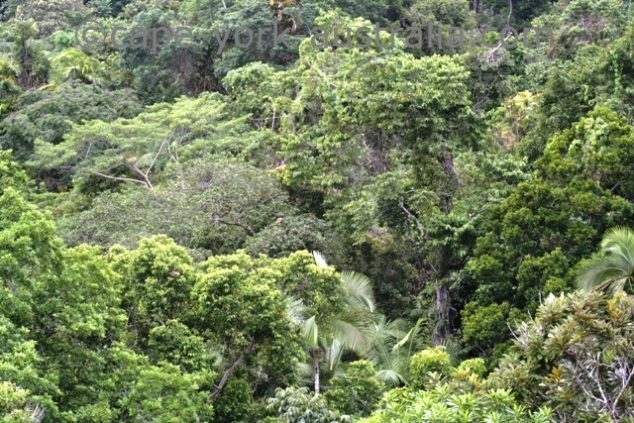 On the ground level is info about different types and elements of the rainforest. On the first level are the climbers and the different methods that plants use to climb up to the light. On the second level are butterflies, on the third level birds. On the highest level is information about pollination as well as emergents - the tallest trees. 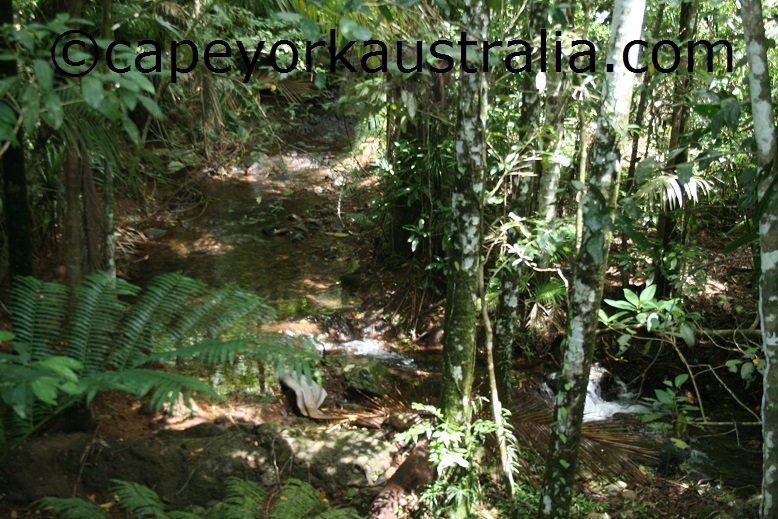 Apart from good chances to see cassowaries, you will walk past signposted plants such as fan palms, breadfruit, tulip oak, mahogany, candle berry, electric fern, Noah's walnut, stinging tree, cassowary plum, sassafras, red cedar, native nutmeg, vivious hairy mary, needle berry, wait a while and idiot fruit. 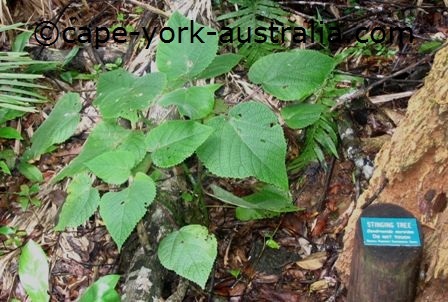 This, shorter, trail, goes past some bush tucker plants such as native nutmeg, kharki bark walnut, matchbox bean vine, walking stick palm, scrub breadfruit, cassowary satinash, davidson'e plum, calamus palms and black beans; and contains information about native figs, birds, bats and flying foxes, spiders, and insects including the larvae called witchetty grubs. There is also information about Aboriginal bush medicine such as acacia and eucalypt plants including white ash, red ash, Alexandrian laurel and mistletoe.